In one study, appearing online Feb. 26 in Cell, scientists showed that Alzheimer’s brain plaques build up more slowly in mice that have a defective version of the TREM2 protein. 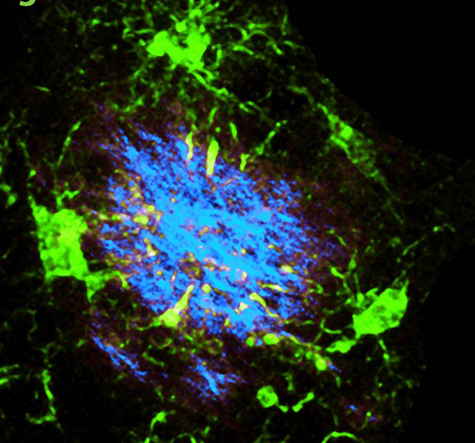 In another, published Jan. 29 in Acta Neuropathologica, researchers showed that mice lacking the same protein had trouble cleaning up debris in the brain produced by damage to a protective coating on nerve cells. The problem is thought to occur in MS and other neurological disorders. “We’ve been very interested in identifying ways to control naturally occurring mechanisms that help clean and repair the brain, and these new studies provide clear evidence that TREM2 could be just such a target,” said Laura Piccio, MD, PhD assistant professor of neurology and senior author of one of the studies. Previous studies have linked rare forms of the TREM2 gene to early-onset dementia and increased risk of Alzheimer’s disease, Parkinson’s disease and amyotrophic lateral sclerosis (ALS). In Alzheimer’s disease, amyloid beta, a byproduct of brain metabolism that is normally cleared from the brain, builds up to form plaques. Researchers in the laboratories of Marco Colonna, MD, the Robert Rock Belliveau MD Professor of Pathology, and John Cirrito, PhD, associate professor of neurology, bred mice lacking the gene with mice genetically engineered to have an Alzheimer’s-like condition. The research was supported by the Lilly Innovation Fellowship Award; the Washington University Digestive Diseases Research Core Center, grant P30 DK52574; the National Multiple Sclerosis Society; the Knight Alzheimer’s Disease Research Center, pilot grant P50 AG005681-30; and the Cure Alzheimer’s Fund. Cantoni C, Bollman B, Licastro D, Xie M, Mikesell R, Schmidt R, Yuede CM, Galimberti D, Olivecrona G, Klein RS, Cross AH, Otero K, Piccio L. TREM2 regulates microglial cell activation in response to demyelination in vivo. Acta Neuropathologica, Jan. 29, 2015. DOI 10.1007/s00401-015-1388-1 The research was supported by the Fondazione Italiana Sclerosi Multipla, the National Multiple Sclerosis Society and the Dana Foundation.